Toyama Castle (富山城) is a flatland castle lcoated in Toyama city. It was built in 1543 by JInbo Nagamoto. The main entrance and a great keep are reconstructed. 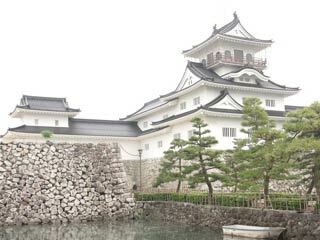 Its keep, moat and stone walls are offers you the great time of Sengoku period. Because it was located on the crossing point of Hokuriku Road and Hida Road, Toyama Castle was very important castle since Muromachi era. Today, there are museum and the first bailey becomes a play ground for family activities. Built in: 1543 by Jinbo Nagamoto. During the Muromachi era, Jinbo clan became Sugodai, the minister of the lord of Echizen, and he built his castle. Because Toyama Castle was located on the very important spots, many feudal lords such as Uesugi Kenshin attacked this castle. Later, Sassa Narimasa of Oda Nobunaga, became the lord of this castle. He extended this castle to made this more stronger. He used water of the river well. Because the castle looks like floating on these water, this castle was also known as "Uki Shiro," the floating castle. After Honnoji in 1582, Sassa was defeated by Hideyoshi, and Toyama Castle was ruled by Maeda Toshiie. His son Toshinaga moved to Toyama Castle after his retirement, but Toyama Castle was burnt down. There was no Tenshukaku in Toyama Castle. The only remaining building is the Chitose Gate which is used for eastern side of the gate. ... was built in 1849. It tooks the highest rank of the gate.